What’s in a name? Dr. Ray O’Neill, Irish psychoanalyst and author, believes you don’t inherit just a way a way to identify yourself, but also the past attachments that plague your particular moniker. Earlier this month he elaborated on that, delving also into artist Salvador Dalí’s name dysphoria, during his part of the lecture “Double, Double, Toil and Trouble; Narcissism, Mourning & Sexuality: Freud and Lacan meet Dalí and Goldin, An Illustrating Lecture with Claire-Madeline Culkin and Ray O’Neill” at Brooklyn’s Morbid Anatomy Museum. “All names carry ghosts of the pasts and desires in the present. For each of our namings there is a dopplegänger, a double from whom that name has been stolen/inherited, be it an actual person or a desired personal identity,” said O’Neill. 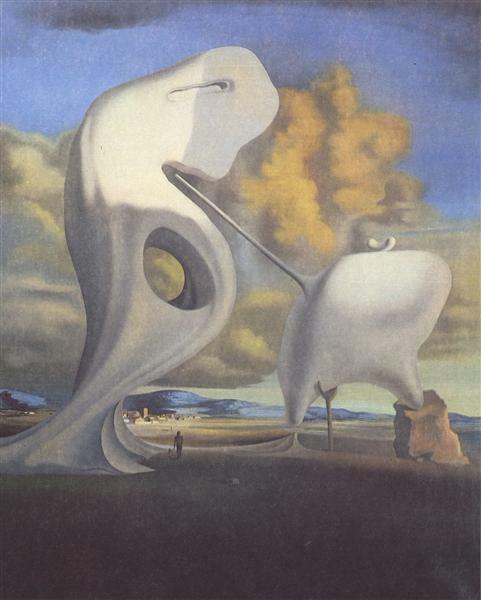 According to O’Neill, “The Metamorphosis of Narcissus” (1937) is Dali’s first significant meditation on a theme he would continue to revisit throughout his life: the double. In the Grecian myth, Narcissus becomes so enamored with himself that he gazes into his reflection, immobilized, for so long that he starves to death. The painting in a way portrays two sets of doubles, two Narcissus figures staring into their own reflections. Dalí grew interested in psychoanalysis in the early 1920s when studying in Madrid, and soon became familiar with the works of Sigmund Freud. In 1929, he met psychoanalyst Jacques Lacan, who recommended he read his treatise on paranoia, which would profoundly influence Dalí’s work. Paranoia — the projection of internal anxiety on the external world — became a way for Dalí to transfigure his past anxieties into surrealistic paintings. My whole ambition in the pictorial domain is to materialize the images of my concrete irrationality with the most imperialist fury of precision. … Paranoiac-critical activity organizes and objectifies in an exclusivist manner the limitless and unknown possibilities of the systematic association of subjective and objective “significance” in the irrational. Lacan, who also had a deceased infant brother, developed his “Mirror Stage” theory in 1936, within a year of Dalí’s “The Metamorphosis of Narcissus.” Though it later evolved, the original theory stated that the event of a toddler first recognizing himself in the mirror is the moment when a human becomes a conscious being. The “Mirror Stage” conjures images of a baby looking into his own reflection, creating a double: the body and its consciousness. In Western literature, doubles and doppelgängers are usually ominous. In Dostoevsky’s The Double, the protagonist’s double causes him to have a mental breakdown. Edgar Allan Poe’s doppelgänger of “William Wilson” causes his double to accidentally stab himself. The surrealistic art movement allowed the subconscious to be visualized with distorted images and dreamlike interpretations. One way Dalí used this was by incorporating anamorphic figures, such as the doubles seen in “The Metamorphosis of Narcissus.” The amorphous double is proliferated in his later paintings, such as “The Great Paranoid” (1936), “The Endless Enigma” (1938), and “The Architectural Angels of Millet” (1933). “The Architectural Angels of Millet” is a surrealistic ode to a painting by Jean Millet that features a solemn rural couple hunched over a field. Dalí was greatly disturbed by Millet’s painting because he believed the figures were mourning an infant, as their basket looked to him like a child’s coffin. He argued that Millet had erased the baby coffin from the painting, going so far as to publish a book on this theory. Art, like psychoanalysis, was an outlet Dalí used to transfigure his grief over his dopplegänger brother, as well as his fear of his own sexuality. While Dali expressed relating to the figure of Narcissus in his poem and in the themes he explored in his art, he was able to escape succumbing to his own reflection, just as Narcissus did. The reflective, all-consuming double became his artist self, and his brother a phantom haunting his paintings. The talk, organized by psychoanalyst Vanessa Sinclair, Psy.D, is part of a series of lectures at the Morbid Anatomy Museum focusing on the intersection between art, psychoanalysis, and the occult. The next lecture will be “The Thing That Knowledge Can’t Eat: Engaging the Power of Archetypes and Deities for Radical Transformation/ Exploring the Seven Souls with Langston Kahn and Demetrius Lacroix” on July 12.